Lær om den lange historien om georgiansk vinsmaking under denne helgedagstur fra Tbilisi. Utforsk Kakheti vinregionen, inkludert stopp på fire forskjellige vinprodusenter, med fokus på økologiske viner. Prøv flere viner sammen med nybakte georgiske brød og oster. Møt lokale vinprodusenter og høre historier om håndverket deres. En tradisjonell grilllunsj er inkludert. We decided to book this tour due to its wonderful reviews and It turned out we made the very best decision! We had a super comfortable Mercedes Viano, with a very careful driver, and superbly pleasant guide. We were 4 girls at the tour, all of us fell in love with guide from the very first glance! I paid attention to the clear narration of her stories and her up to date Information regarding organic wines! From the very first minutes Salome the name of our guide explained us in details what was the tour about : organic boutique wineries. We visited 3 wineries. Each of them was very best and top recommended places! At the end we were granted with a wonderful and delicious Georgian Lunch, we did not have anywhere to rush, and this was decisive factor for our enjoyment! We want to thank the organizers of this tour! We will definitely return gack to Georgia and we will highly highly recommend this company! 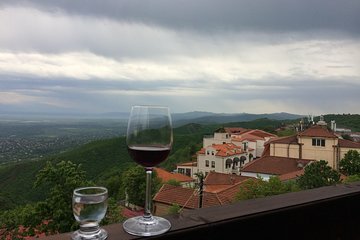 I highly recommend this tour, especially if you are genuinely interested in Georgian wine. One of the highlights of my trip to Georgia. Vaska was a great guide, very knowledgeable, well travelled, and really cares about the experience of his guests. I would recommend to friends and family visiting Georgia. My wife and really enjoyed the tour, which matched exactly the description on the website. The guide and driver were punctual, attentive and knowledgeable, we also had some good laughs. We enjoyed a variety of excellent wines from each of the wineries we stopped at and saw some beautiful scenic spots in the mountains and in Sighnaghi especially. We especially enjoyed meeting Beka at the first winery. I only wish we had a little longer to see more of Sighnaghi. It really was a personal experience and we learned so much about Georgian wines. I would wholeheartedly recommend it. I cannot recommend this tour highly enough. You will get to taste a variety of excellent wines, travel through some beautiful countryside and enjoy a delicious lunch. Much as the wine and food are outstanding, it is the people that really make the day special, however. Vaska, my guide, set a relaxed tone right from the start. He was friendly, super knowledgable about his country and its history and very attentive. The first vineyard was a real treat. Beka, the winemaker demonstrated some of the traditional Georgian winemaking techniques, then we sat under the shade of a beautiful tree to enjoy his superb wines. He treats guests like family and his passion for the work he does is obvious. The views from both the second and third wineries on the tour were absolutely stunning and once again the wines were wonderful. I highly recommend this tour. It is one of the best day tours I have ever done.